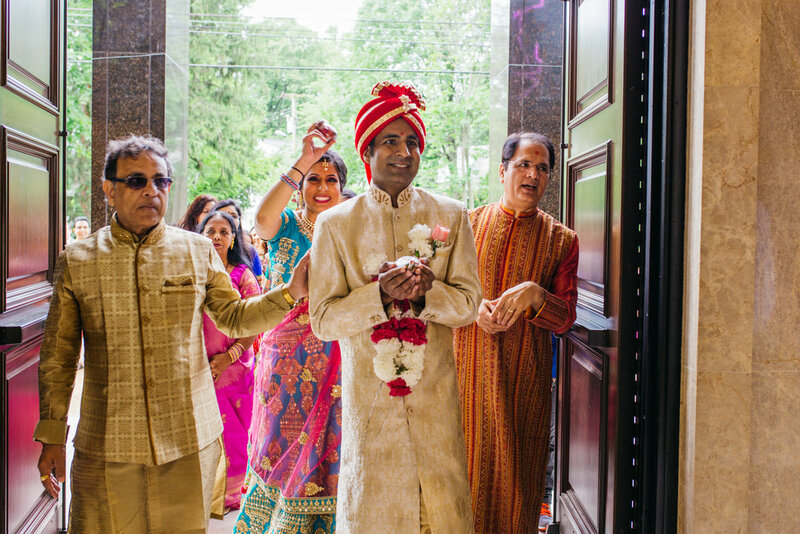 On Memorial Day weekend, I had the pleasure of photographing one of the loveliest weddings of my career so far - a stunning Hindu Gujrati wedding at the Hebrew Congregation of Washington, located in the heart of DC. It was especially exciting to shoot the wedding with my favorite wedding partner in crime, Dan Anderson! The wedding was nothing short of resplendent, and I couldn't have asked for a sweeter couple to work with. I already knew that Tarangi and Ankur were super sweet and wonderfully kind from their engagement shoot last winter, and it was a pleasure to work with them throughout a very long and eventful wedding day. Despite the ups and downs of a wedding day, Tarangi and Ankur were sweet, calm, goofy, and treated Dan and I like their own family. We had a blast spending the day with them! This blog is a bit special as I got to talk to Tarangi and Ankur about each other, and they each gave me some lovely stories. Without further ado, presenting Tarangi and Ankur! Tarangi: You may expect that because we were both in the same place at the same, we have the picture-perfect “how we met” story. The reality is I apparently don’t remember the first time we met! While I remember the people he was with and the day he describes, I don’t recall meeting the man who has become my best friend. I know Ankur is never going to let me live this down! Anyhow, Ankur and I shared mutual friends at Ohio State. I first noticed-noticed him when he smiled across the room at me during his 21st birthday party. We gradually got to know each other better as we went to concerts, festivals and parties with mutual friends. I say it doesn’t matter how we met, but that I grew to love his big heart and ability to make me laugh to the point where my nostrils flare. Ankur: Tarangi and I first ACTUALLY met our freshman year at Ohio State on an elevator in Lincoln Tower. We were introduced to each other by mutual friends, but the conversation ended there. We occasionally ran into each other at different events around campus for the next couple of years, but we did not actually start being friends until the beginning of our junior year. After growing closer throughout the year, we ended up going on our first date in the spring of 2009. Since our first date, I have appreciated Tarangi's smart sense of intuition and ability to bring me comfort in all situations. Where did you have your first date? For their first official date, Ankur planned an evening of what sounded to him like a ton of fun. The catch was that the plans were going to be a surprise for Tarangi! One of the first questions she asked him was, “Well how will I know what to wear?” Ankur soon realized Tarangi was going to keep things interesting. Ankur granted Tarangi three questions to ask leading up to the date. Once she got the answers to her detective-like questions, she pieced together Ankur’s secretive plan, but decided not to tell him in the spirit of fun. Ankur took Tarangi to a Columbus Clipper’s game that evening. After they returned from the game, they went for a stroll around campus and talked until dawn. It was a picture-perfect evening that Tarangi managed not to spoil by spilling Ankur’s surprise! When did you know that this was it? After graduating from Ohio State, Tarangi and Ankur decided to continue their happy relationship despite the distance between their homes and their desires to pursue demanding professional degrees. Ankur moved back to Chicago for work and then started law school in Cleveland. Meanwhile, Tarangi moved back home to Gaithersburg before her transition to Roanoke for medical school. Thank goodness for Skype and text messaging! Over this time, they learned more about each other, fell in love with each others’ families, shared in milestones and created new memories together. There was no aha moment when they knew this was it. Rather, Tarangi and Ankur grew to realize they couldn't live without one another with each passing day. Where did the proposal take place? 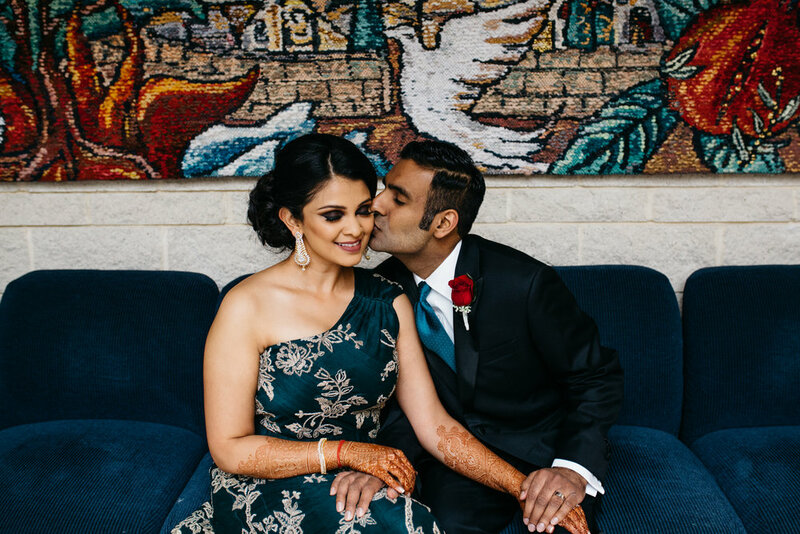 Ankur planned the perfect proposal in Washington, D.C. that was private and sentimental. They immediately shared their excitement with both families as they moved one step closer to their "happily ever after!" What made you decide to get married at the Hebrew Congregation? Since the engagement, Tarangi and Ankur loved the idea of getting married in the city where they hope to establish their home. As soon as they visited the Washington Hebrew Congregation, there was no question that the beautiful chapel with large windows would provide the perfect setting for their wedding. They were also stunned by the grand foyer and gorgeous banquet hall where they cannot wait to celebrate with their closest friends and family. Where are you going for your honeymoon? This is for Ankur to know and Tarangi to find out after the wedding! You know how much she loves surprises! Happy people make the best portraits! ✨ Wedding season is right around the corner and I’m so excited to document lots of love, laughter, and happiness over the next several months! It’s snowing here in the DMV, and I’m dreaming about the three glorious, sunlit days that I spent in Seville last spring with my partner in crime @snackerjee! Seville was filled with gorgeous visuals at every turn - a photographer’s dream! One of my favorite things were the winding, narrow streets, the colorful buildings and shutters (especially the coral and yellow ones! ), the wrought iron balconies, and of course the greenery! Fewer things bring me more joy than golden winter light, antiques from our ancestral home in Varanasi, beautiful jewelry, and of course, my mom’s never ending collection of saris (that I’m always stealing as backdrops hehe). The light was just right a few weekends ago - perfectly warm and gilded, so naturally I had to shoot some more things as a part of my antique series. This gorgeous kundan stunner from @zahana.in made for the perfect foil to photograph the brass lamp holder, surrounded by the stunning, sheer softness of a gold and white dhakai jamdani and of course a whole lot of bokeh. ✨ On another note, it’s been ages since I photographed something for myself, spur of the moment, for myself - and god I how I missed that feeling! Santa Barbara or Spain - you tell me! Totally fell in love with the sun, stunning architecture, Spanish tiles, and of course the gorgeous bougainvillea during my brief visit of this beautiful city! Can’t wait to go back - I could spend hours just in the Courthouse! This year’s top nine! Sums up my year and my favorite things perfectly - weddings, details, color (DUH), my favorite two people @varungr890 + @sravyakurapati who (finally! 😜) got married, jewels and my fav model @tanviidotcom, and of course, Spain and traveling with @snackerjee! ✨ This year was a roller coaster of the highest highs and lowest lows, but I’m proud that I came out resilient and still standing at its end. I’m not really one for new year’s goals, but I do have a few in mind for next year: better health (mental and physical), more adventures, and stronger bonds. Hello 2019! @divsigupta’s travels and stunning photos have got me reminiscing about Spain (and the billion photos that I have yet to share!). This stunning patio in Córdoba is the perfect remedy for the biting cold weather here in DC - take me back!! So excited for Durga Puja/Navaratri festivities to start this weekend!! Durga puja is an extremely colorful yet slightly bittersweet time for me. It makes me miss the grand Durga Pujas we used to have in our ancestral home in Varanasi, and makes me nostalgic for the Pujas in Kolkata, which overtake the whole city - but which I have never seen myself, only caught glimpses of in photos and accounts from friends. Here in DC, I’m so incredibly lucky to have a huge Bengali second family, where we celebrate with just as much enthusiasm as we would’ve in Varanasi or Kolkata - new clothes, bhog, temple visits, listening to Birendra Krishna Bhadra’s timeless mahalaya recordings in the mornings. Each year, the smell of incense, camphor, and sandalwood, and the steady, familiar chants of the mantras, the unmistakable sounds of kaanshis and dhaak drums always fill me with equal measures of joy and nostalgia. Here’s hoping that I can be in Kolkata for a Pujo, super soon! Shubho Mahalaya and Shubho Sharodiya to all everyone who celebrates Durga Puja! As per my annual tradition, I put together a shrine for this year’s puja with my favorite clay statue, lots of flowers, greens from our garden, and heirloom puja articles that go generations back in my family. If you scroll the origin you’ll see a copper vessel, and a 5 pronged brass oil lamp. Despite not being an overly religious person, Durga Puja is one of my favorite festivals and very close to my heart, and I’m so excited to get all dressed up, eat tons of delicious bhog, and spend time with my family and friends in a few short days! !